Happy Sunday! I just finished our last bit of gift wrapping and planning to venture out on a run in the overcast and cold weather shortly. I had a productive day yesterday of wrapping, finishing up holiday donations, and shopping at Trader Joe’s. Not enjoying the holiday traffic and sharing the roads with so many stressed out and angry drivers! I drove by our mall and the lines to even get into the parking lots were stopped on the roads and the parking lot was not moving. Insane, who would do that to themselves? 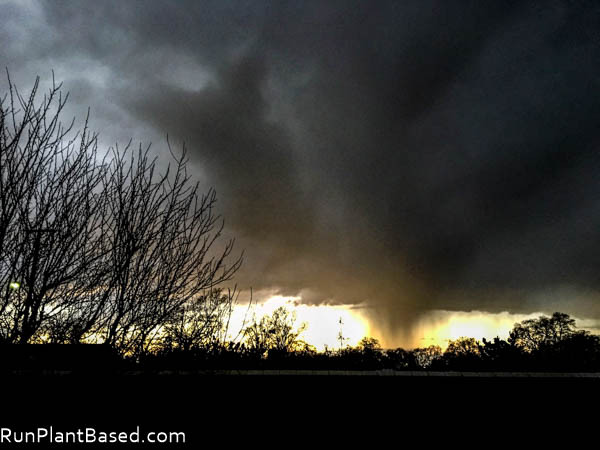 Last weekend we got a lot of rain and I shot this cool pic from our back yard. 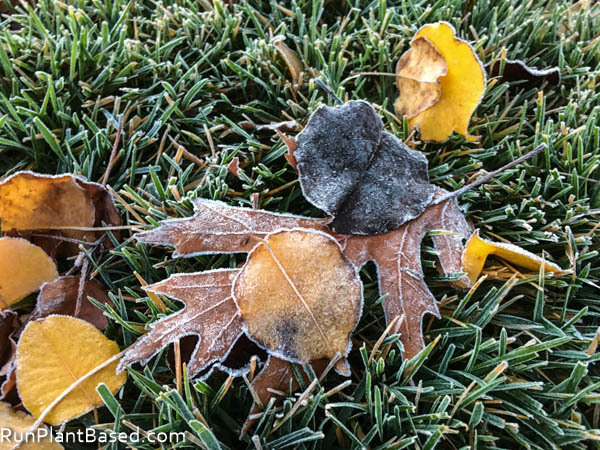 And tons of frost the next few mornings! Isn’t it pretty? Maybe not so much for the neighbors trying to scrap it off their cars, thank goodness for garages! 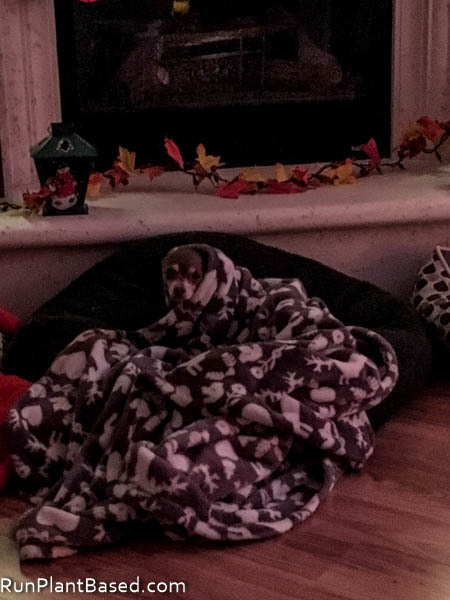 Leela is not thrilled about the cold and refusing to leave her snugly blanket for trips to the backyard. 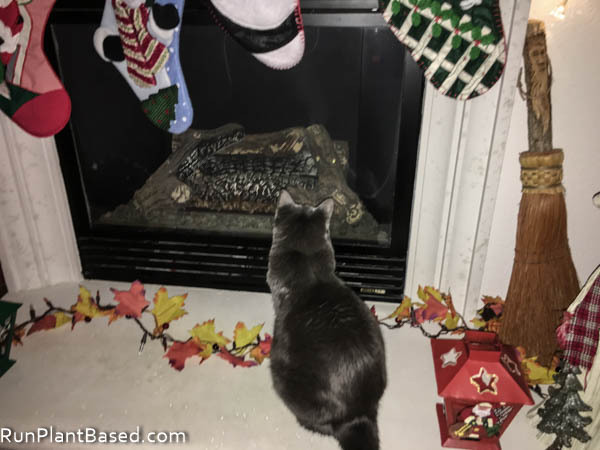 Smokey would like the fireplace to be on all the time so she can watch her favorite show. 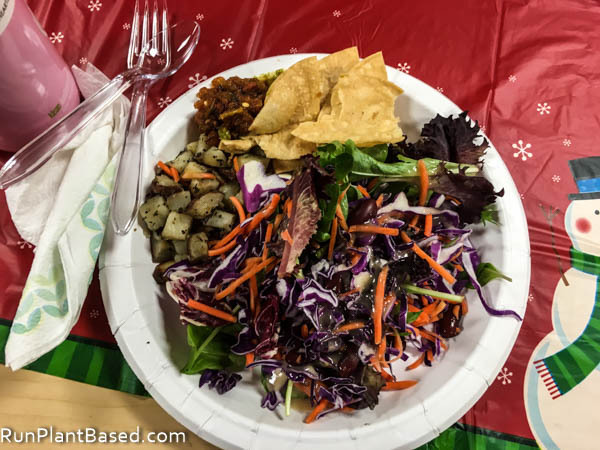 Last week we had our department potluck holiday party and the vegan options were weak – pretty much the salad I brought, a potato dish, salsa and chips, and fruit – that’s it. I heard a lot from co-workers, “Oh sorry, the dish I brought would have been vegan, except…” they used chicken broth, milk chocolate chips. etc. Truthfully I was a little disappointed at the massive amount of meat dishes brought as I watched co-workers load up their plates with no room for salad. At the same time, I was okay with not having the temptation of any of the dessert dishes because there were tons of those too! 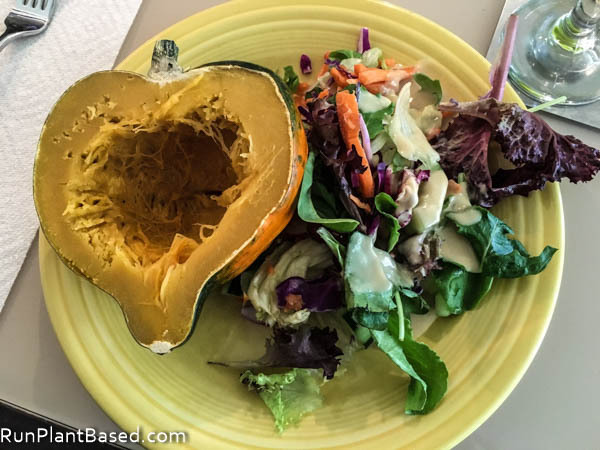 I made use of the salad leftovers for the rest of the week like this simple lunch of baked acorn squash and salad. 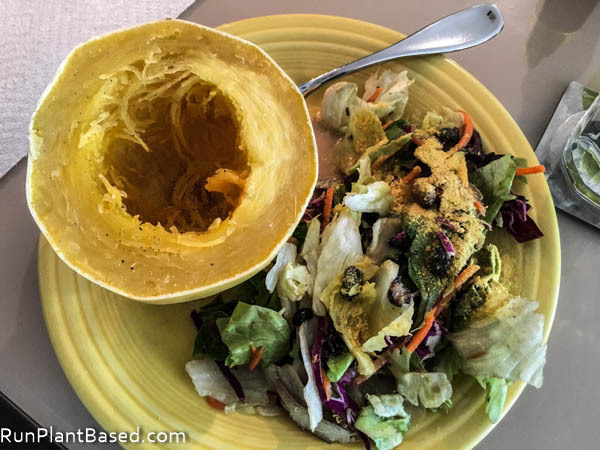 And another with steamed spaghetti squash. 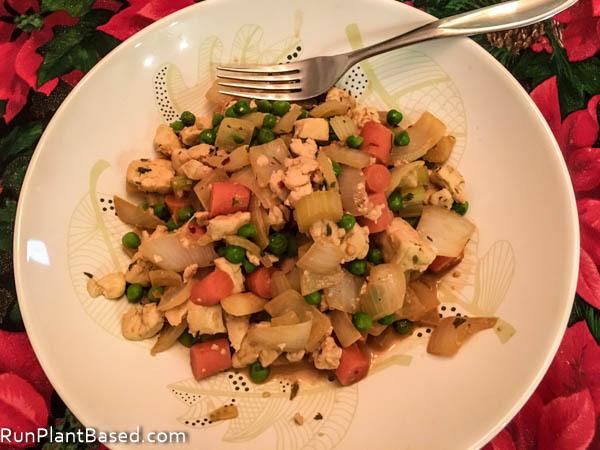 I knew I’d be spending a lot on groceries for Christmas, so I avoided shopping this week to use up what we had and came up with this interesting tofu oil free stir fry with frozen peas, celery that needed to be used up, onion, and carrots. 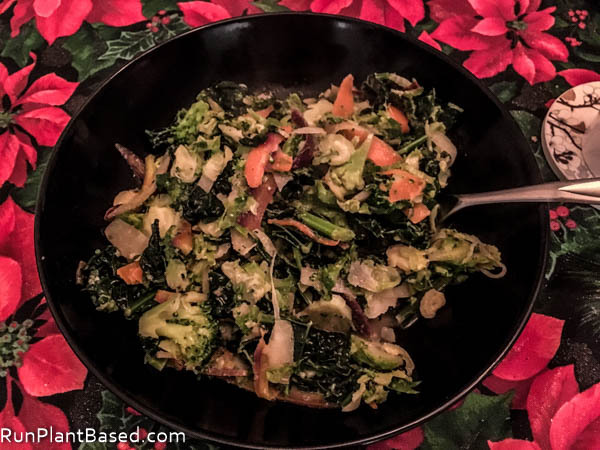 And a colorful kale and shaved Brussells sprouts saute with broccoli. Friday night we headed to a local sushi place that has vegan items on the menu, but no vegan sushi rolls. Usually when we go, I get udon noodle soup, seaweed salad, edamame, veggie tempura, etc. I decided to be daring and show there is a demand for vegan sushi rolls and requested three vegan rolls for hubby and I to share. What we got was a unique and awesome creation! 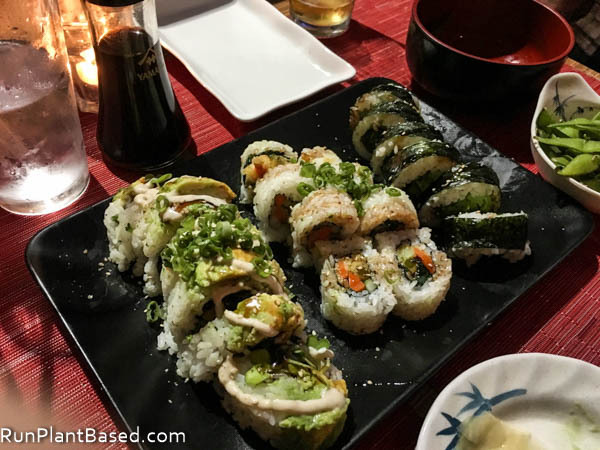 Broccoli seaweed roll, tempura carrot roll, and a tasty and slightly messy roll stuffed with greens and topped with avocado, a tangy ginger sauce, and green onions. And it wasn’t expensive at all compared to the elaborate non-vegan rolls on the menu. I’m excited to know we can get these kind of unique vegan rolls from them now and looking forward to the next visit. The Vegan Zombie recently posted the video of Miyoko’s Meet and Greet Speech from the Vegan Vacation at Sea and it’s great! It’s easy and getting easier to be an unhealthy vegetarian or vegan with the growing number of processed junk food options. This inspirational woman found her processed vegetarian diet wasn’t working and did something about it switching to a simpler, whole foods, plant based diet and helping her family. This personal trainer made an impressive health transformation when he got a cholesterol scare. And this guy got off his medications and became a strong runner. This is an interesting look at a high fat diet fueling insulin resistance and diabetes. More on animal agriculture wrecking the environment and food sustainability. After sticking to a plant based diet for 7 years, this author offers tips on how she does it. I need to try this VeganEgg product and can hopefully track it down for Christmas morning. Mmmm, vegan gingerbread protein bites. More healthier dessert recipes for the holidays. The holidays are loaded with stress! Here are some tips for dealing with it. And tips for handling Christmas dinner as a vegan. Sorry to hear about the office party! I had a similar thing happen with Tom & Jerry’s lately…I never knew what was in that drink until last week and I’ve never had one either. Over the weekend someone asked if I wanted one (it has egg whites among other things in them) and then they said Oh…you don’t eat eggs…do you want a little sip??? LOL How would that make it ok? Cute pet pics, your dog is doing exactly what my dog is doing. Ha, the office party is the worst! Well, you’d always be able to eat my dish, although it’s typically boring! At our church potluck, I just brought plain sweet potatoes and plain mashed squash. Boring, but vegan and delicious and honestly kind of the way I like to eat. Sorry your co-workers didn’t try to be a little more considerate! So true, I understand that everyone has their own diet preferences, but it seems sad to celebrate the holidays with excess animal products. Thanks and it was a great experience, great to know we can go there more now. I love all your food pics. There’s usually one veggie roll at most sushi places I go to but that’s a great idea for you to ask them to be creative! I did that once and they gave me carrots and cucumber but I’m going to try again and hope another place is as creative as your sushi place is. That really stinks though that your co-workers didn’t make anything for you to eat for your party. We had our party last week and most people brought vegan food for me. I hope next year your co-workers will be more mindful for you – you deserve to eat well too. I hear you about the non-vegan desserts – I love that I can almost never eat them – saves me the calories lol. I was just learning about how fat affects insulin resistance. Thanks for sharing the link with that great video on it. Sorry to hear about the disappointing potluck- That really stinks! On the one hand, at least everyone was aware enough to warn you about the non-vegan additions, but on the other, why couldn’t they have thought of those problems in advance and made simple substitutions?! Ugh, there’s no good answer, I know, but it’s still frustrating. Glad you made up for that with lots of other delicious meals later on. The sushi in particular looks amazing! Thanks and agreed, I don’t want to be high maintenance at the potluck. But these are co-workers that I’ve worked with for a long time and have even danced with veganism themselves. Ugh, that is so frustrating! Agreed, it’s annoying when the vegetable dishes contain more oil and fats than actual vegetables and it seems so many restaurants and catering companies go there as a crutch for quality ingredients.